Our newest collaborator, Gretchen Miller and her Art Therapy Collective 6 Degrees of Creativity has been rounding up a delightful batch of delegates to send to the Boys and Girls Club of Hoboken, which was devastated by Superstorm Sandy. A week or so before the hurricane rocked the east coast, Gretchen approached OSM with the desire to organize a ‘Sock Monkey Service Project’ for the Holiday season. Gretchen began to collect delegates, though we weren’t sure yet where they would be sent. 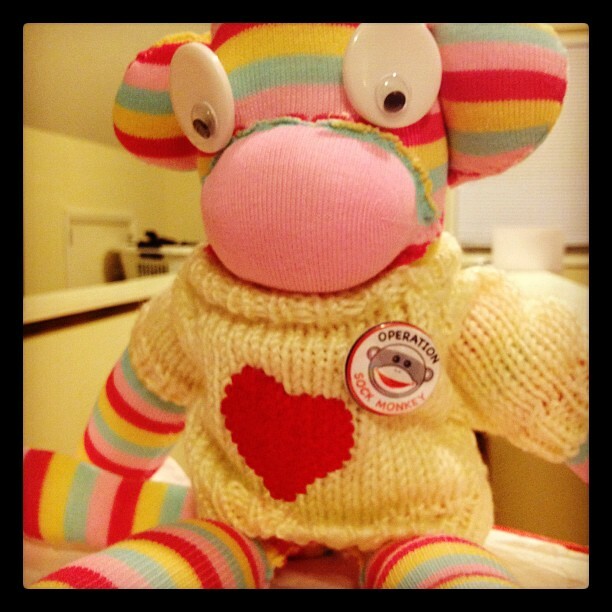 Shortly after the storm hit and the degree of damage became apparent, 6 Degrees of Creativity community member, sock monkey maker, art therapist, and New Jersey resident Suzanne Martino came forward and identified the potential need for some sock monkey magic in her devastated community. Together, Suzanne and Gretchen reached out to the director of the Boys and Girls Club of Hoboken, who is thrilled to receive some OSM delegates for the holidays. Sock Monkeys from this delegation have been donated from Operatives all over the U.S. and will be distributed to the community’s youth in the week of December 17-21. BIG THANKS to Gretchen Suzanne and the 6 Degrees of Creativity community for organizing and executing this wonderful initiative and allowing OSM to send some smiles to the good folks of Hoboken, New Jersey.